Please choose the part number based on the capacity of your Flash product. The part number may also vary based on a specific design (i.e., DT109B/16GB and DT109K/16GB). The correct information to place in this field relates to the number of actual memory products you are having a problem with. If the product has multiple pieces in it (e.g., a USB drive with a separate cap and lanyard), this qualifies as a single product and you should enter "1" in this field. Most memory products will contain a Revision Number. This number is used to help identify your product. 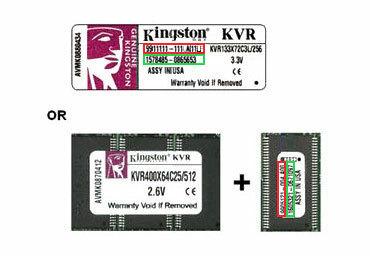 Please refer to the illustration below to locate the Revision Number on your Kingston memory product. Please note, the (99) and/or (LF) may not be present. This refers to the manufacturer of the computer, motherboard or other device you are using the Kingston product with (i.e., Apple, Asus, Samsung, Toshiba, etc). This does not refer to Kingston itself. This refers to the model of your computer, motherboard or other device (i.e., iPhone 5, Sabertooth Z87, Galaxy S4, Satellite S55-A5352, etc). Documentation indicting place and date of purchase is required for warranty replacements. 본인은개인 정보 보호 정책을 읽고 이해했습니다.